Maisie Danger Brown just wanted to get away from home for a bit, see something new. She never intended to fall in love. And she never imagined stumbling into a frightening plot that kills her friends and just might kill her, too. A plot that is already changing life on Earth as we know it. There's no going back. She is the only thing standing between danger and annihilation. 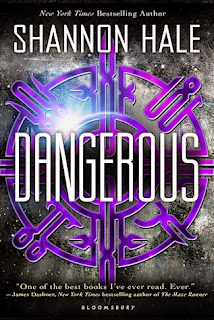 I went into Dangerous not knowing what I would expect but even still, I found myself confused and unsure of where this story would go. There were some strange turns I'm not sure how I feel about, yet I did find myself enjoying some of the high-tension action scenes which occurred towards the end of the book. As a whole, it was a little too unrealistic for my taste, with infrequent pacing and an infuriating romance. I think this book could have benefitted from being a part of a series, or at least a duology. Things were too rushed, and there was a lack of world-building - particularly towards the beginning. There was so much potential to explore the elements of space and aliens more deeply, I feel like I was missing out! The first 100 or so pages could have been a book on its own. There is a pivotal point for the characters which was skimmed over, leaving me confused and unimpressed. I would have loved to see a stronger set-up with more character development and suspense - I feel like this would have made it more believable and exciting. Maisie Danger Brown is our main character. At the start of Dangerous, I really liked her. She was witty and intelligent, and never let her disability slow her down. She comes out with some hilarious remarks, though at some points it was a little inappropriate for the situation. Nevertheless, I liked the humour and clever dialogue that was attributed not only to her, but a few of our other characters as well. In particular, her father was known for his love of puns and bad jokes. Page 36 - le kiss. Page 39 - now an almost couple? "Are you checking out my girl?" Page 47 - S**t goes down - Wilder walks off with arm draped around some ditzy girl. All of this happened during a two-three week period in the story, though it was crammed together in those 30 pages. I found this a little frustrating and overwhelming, having so much happen so quickly (this wasn't just restricted to the romance, though, everything was rushed during that first part). The romance constantly fluctuates like this for almost the entire remainder of the book, with a little added frustration later on from boy #1 - the best friend. In terms of our side characters, they didn't have much depth. I don't remember much about them, to be honest. This is where I think expanding the story whilst in the space camp would have been beneficial. I would have loved to get to know these characters a little more. Not only that, but there was so much potential to go wild and have some fun with that camp. Maisie breezes over some of the training and activities they do. It would have been awesome to actually have experienced that a little more. Overall, I was left feeling underwhelmed and slightly irritated. I would have loved to experience more epic-ness in the space camp, and some of the proceeding events definitely could have been approached more realistically and believably. Some things just seemed to happen on a whim, which was bizarre in such a scientific and dangerous environment. That being said, it wasn't a terrible book. There were some things I liked, but on the whole I feel like there were quiet a few things needing improvement. It definitely had the potential to be awesome!